Sherlock Holmes as you've never seem him - or is it her? - before, as the Great Detective travels through time and across continents to master a set of three new mysteries. Sherlock Holmes and her partner Dr. John Watson have barely set up as consulting detectives in LA before Tinsel Town's finest come calling. Joey Jackson and Tony Antonelli are in trouble: their partner, Cliff Camden, has disappeared without a trace on the eve of filming for a new show. The LAPD don't care and Watson has his own reasons for wanting to stay out of it, but Holmes takes the case. Winter, and the Soggiorno Brothers' Traveling Wonder Show has pulled into its berth in Peru, Indiana. Sanford "Crash" Haus, proprietor and genius, and his friend, the retired soldier-turned-surgeon Jim "Dandy" Walker, are looking forward to a quiet few months. By happy coincidence, just as the Strong Man and the Tattooed Lady announce their betrothal, the Wonder Show's old manager Professor Sylvestri - a minister, no less - rolls into town with his ward in tow. 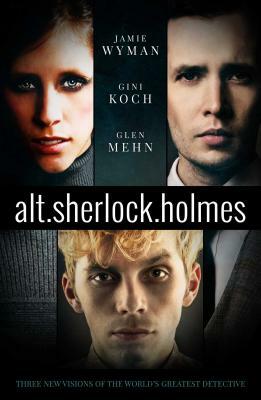 Although she's best known for science fiction, paranormal, horror, and fantasy, Gini Koch's (ginikoch.com) first literary love is mystery and suspense, and her first literary crush, at the tender age of 7, was on Sherlock Holmes. Gini writes the fast, fresh and funny Alien/Katherine "Kitty" Katt series for DAW Books, the Necropolis Enforcement Files series, and the Martian Alliance Chronicles series for Musa Publishing, and as G. J. Koch she writes the Alexander Outland series. Gini's made the most of multiple personality disorder by writing under a variety of other pen names as well, including Anita Ensal, Jemma Chase, A. E. Stanton, and J. C. Koch. Her dark secret is that pretty much everything she writes has a mystery in it--because mysteries are the spice of literary life. Glen Mehn (glen.mehn.net) was born and raised in New Orleans, and has since lived in San Francisco, North Carolina, Oxford, Uganda, Zambia, and now lives in London. He's previously been published by Random House Struik and Jurassic London, and is currently working on his first hopefully publishable novel. When not writing, Glen designs innovation programmes that use technology for social good for the Social Innovation Camp and is head of programme at Bethnal Green Ventures. Glen holds a BA in English Literature and Sociology from the University of New Orleans and an MBA from the University of Oxford. Glen has been a bookseller, line cook, lighting and set designer, house painter, IT director, carbon finance consultant, soldier, dishwasher, and innovation programme designer. One day, he might be a writer. He lives in Brixton, which is where you live if you move from New Orleans to London. He moved country five times in two years once, and happy to stick around for a while. After a misspent adulthood pursuing a Music Education degree, Jamie Wyman (www.jamiewyman.com) fostered several interests before discovering that being an author means never having to get out of pajamas. She has an unhealthy addiction to chai, a passion for circus history, and a questionable hobby that involves putting a flaming torch into her mouth. When she's not traipsing about with her imaginary friends, she lives in Phoenix with two hobbits and two cats. Jamie is proud to say she has a deeply disturbed following at her blog. Jamie's debut novel Wild Card (Entangled Edge, 2013) is available wherever ebooks are sold. You can also find her short story "The Clever One" in the anthology When The Hero Comes Home 2 (Dragon Moon Press, August 2013). Look for Unveiled, the follow-up to Wild Card, in November 2014.